जानवरों की बलि चडाने से क्या होता हैं हिन्दू धर्म मैं किसी भी जानवर को हानि पहुंचना पाप हैं हम लोग जानवरों को फालतू मैं क्यों अपने सर पे जानवरों की हत्या का पाप चदते हैं? और मेरा तो यह मानना हैं कि जानवर से पवित्र तो इंसान होता हैं तो भगवन के आगे इंसान कि बलि क्यों नहीं चर्धायी जाती हैं? 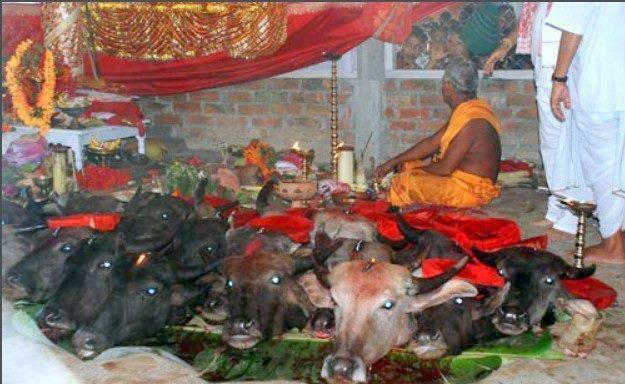 me too think that what is the reason for sacrificing the animals. First they say that they are god to us. Ya they are doing is only killing animals for filling their stomachs and using the name of god in killing the animals. But the think we should focus on is that the "GOD creates don't DESTROYES"
And the most shocking think is that the priest is also interested in such type of thinks. can't say anything about this.